Strange Lands is the fruit of Andrew L. Paciorek's voyage into the Celtic Otherworld in search of Faeries, Goblins, Monsters, Angels, Demons and much more besides. Within the 400 pages of the book are descriptions and tales of a multitude of bizarre beasts and weird entities, accompanied by over 170 original pen and ink depictions. A number of these visions were the focus of an exhibition held at Durham Art Gallery in January 2006 and form but a fraction of the art oeuvre of Andrew L. Paciorek. The names to the left represent the fifteen galleries of this Strange Lands website. Click a name to enter that gallery. 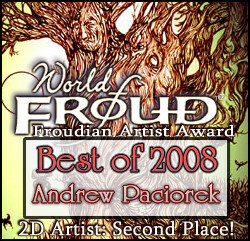 The Strangelands website was awarded Second Place in the 2D Art category of Froudian Artist of the Year 2008 by Brian and Wendy Froud's 'World of Froud' website.